ABOVE: Platte County seniors Gavin Hardman (4), Devin Richardson (11) and John Watts (right) react after the final play of a 21-18 loss to Webb City in a Class 4 semifinal Saturday, Nov. 18 at Cardinal Stadium in Webb City, Mo. On what ended up the final play of Platte County’s historic season, Tanner Clarkson’s pass fluttered in the crisp autumn breeze toward wide receiver John Watts. The ball fell harmlessly to the turf at Cardinal Stadium, and the celebration began for Webb City’s players and coaches. The Pirates were left hoping for one more play, coming up agonizingly short in a 21-18 loss to the Cardinals on Saturday, Nov. 18. Platte County never led in the first Class 4 semifinal game in program history, unable to knock off dynastic Webb City — winners of 13 Class 4A/4 state championships since 1989. Platte County senior quarterback Tanner Clarkson throws a pass in a Class 4 semifinal Saturday, Nov. 18 at Cardinal Stadium in Webb City, Mo. Platte County (11-3) twice came back from double-digit deficits in the second half to keep the outcome in question. Dakota Schmidt — a senior linebacker — made an acrobatic interception near midfield with 6 minutes, 45 seconds left to kickstart the Pirates’ final touchdown drive. Clarkson completed a pair of passes to senior wide receiver Devin Richardson and then a 35-yarder to Watts down at the 2. Platte County senior running back Gavin Hardman then plowed into the end zone for his second short touchdown run, and a two-point pass to junior wide receiver Dylan Gilbert cut Webb City’s lead to 21-18 with 5:51 to go. Webb City then marched down the field with its option running attack, which produced 257 yards on 59 attempts, to kill off most of the remainder. Platte County senior defensive end Michael Smith chased down Cardinals quarterback Cash Link (3-for-9, 66 yards) for a sack on fourth down with 31.5 seconds left. Starting at the 34-yard line, Platte County reached midfield with 7.2 seconds left before Clarkson threw what turned out to be the final pass toward Watts in the red zone. Platte County senior linebacker Kobe Cummings (7) returns a punt behind a block from senior linebacker Dakota Schmidt against Webb City in a Class 4 semifinal Saturday, Nov. 18. Platte County made the state semifinals for the sixth time in program history and the first time since 2005 when the Pirates were still in Class 3. The season started with an unknown senior quarterback and a pair of high-scoring wins over Grandview and Oak Park. Platte County then lost 62-27 to No. 1-ranked Class 5 state finalist Staley before reeling off a five-game winning streak that included a memorable overtime win against Class 5 district finalist Liberty. While a 38-31 loss in overtime to chief rival Kearney in the regular season finale cost the Suburban Conference Blue Division title, Platte County rallied in the postseason behind an improved defensive showing. The Pirates allowed just 34 points total in wins over Benton, Smithville and then Lafayette, which upset Kearney in the district semifinals to earn a spot in the Class 4 District 8 title game. Platte County finally conquered its difficult district bracket after back-to-back runner-up showings then dismantled Moberly 42-14 in the quarterfinals. That set up the meeting with No. 1 Webb City (14-0), which advanced back to the title game for the seventh time in eight seasons while denying Platte County of its first Show-Me Bowl berth since the Pirates won three straight undefeated Class 3A titles from 2000-2002. “These seniors, one of their goals was to go further than the class before them. They did that,” Utz said. 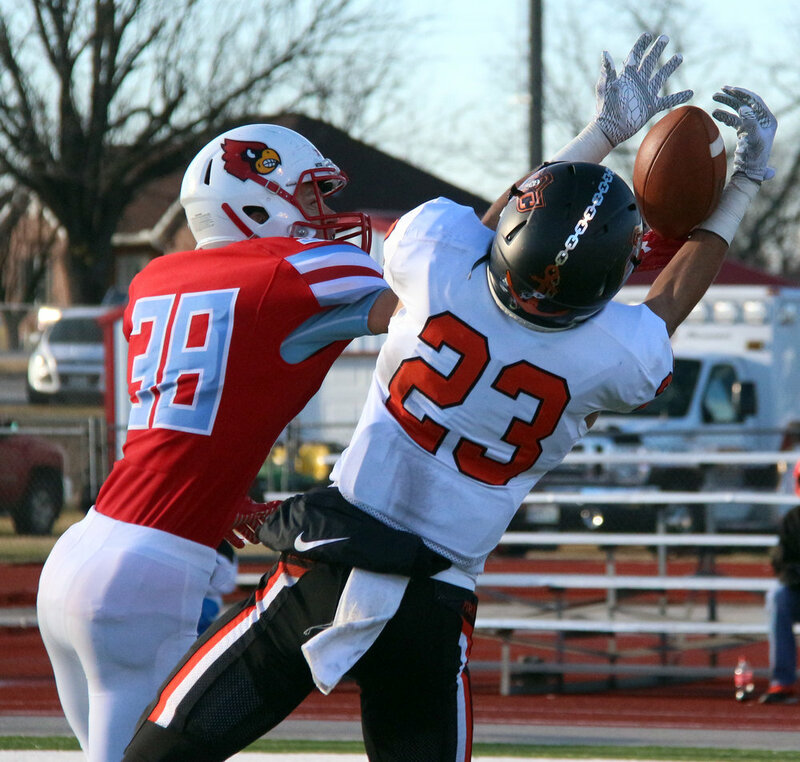 Platte County senior wide receiver John Watts (23) makes a catch against Webb City in a Class 4 semifinal Saturday, Nov. 18 in Webb City, Mo. Platte County’s success started with Clarkson’s performance in his first year as starter. He ended up with school single season records for passing yards (3,385) and passing touchdowns (38) — breaking the previous marks James Valentine (2,711 in 2012) and Brandon Gutshall (30 in 2000) held. Watts, Richardson and Gilbert helped keep the pass offense balanced. In his final game, Watts caught seven passes for 136 yards, and he finished the season with 63 catches for 1,003 yards, becoming just the fourth receiver in Platte County history to hit the 1,000-yard mark. His 103 catches the past two years rank him sixth all time for a career in Pirates history, while his 20 touchdowns are fifth. Richardson came into the season with just one catch in his career but totaled a team-high 64 (second in a single season in Platte County history) for 1,079 yards (third). He caught 16 touchdown passes — at least one in 11 of 13 games played this season — to tie the 50-year-old record for a single season Jim Myers set in 1968. Platte County players, including offensive linemen Matt Blaha (55) and Peyton Stoner (52). celebrate a touchdown during a Class 4 semifinal Saturday, Nov. 18 at Cardinal Stadium in Webb City, Mo. Platte County also employed a two-running back system of Hardman and junior Adel Freitek, who combined for nearly 1,500 yards rushing. The offense worked behind a remade offensive line that lost junior left tackle Glen Gammill to a torn ACL late in regulation in the win over Liberty. Matt Blaha, a senior, slid over from left guard to play tackle for the first time in his career, while junior Peyton Stoner started the final three games at left guard. Platte County senior Trevor Tietz (center) and junior Reid Sutter (right tackle) were the anchors, while sophomore Max Renner and senior Matthew Knopp continued to rotate at guard. ABOVE: Platte County seniors Michael Smith (5) and Dakota Schmidt (bottom right) make a tackle in a Class 4 semifinal Saturday, Nov. 18 at Cardinal Stadium in Webb City, Mo. The line keyed the defense with Smith recording at least one sack in 12 of 14 games and finishing with a school record 17½. He combined with seniors Chase Blankenship and Sage Smart and sophomore Garret Watson (seven sacks, 11 tackles for loss combined) on a unit that freed up senior linebackers Schmidt (team-high 131 tackles, 12 TFL, two sacks, two blocked punts) and Kobe Cummings (91 tackles, 13 TFL, 7½ sacks, two fumbles forced, two fumbles recovered, one interception) to make plays. Gilbert ended up the cornerback opposite of senior JP Post (team-high three interceptions) for Platte County while junior Nolan Saale and seniors Jackson Phan and Hunter Tongate were the safeties for a defense that allowed 21 or less in 10 of 14 games. Platte County’s undoing ended up being a bunch of small missed opportunities. The Pirates committed three turnovers, two on the first two drives, but none led to points. Platte County junior wide receiver Dylan Gilbert makes an over-the-shoulder catch in the second quarter against Webb City on Saturday, Nov. 18. Despite having the better of the first half, Platte County went behind 7-0 in the second quarter when Webb City reeled off a 13-play, 75-yard touchdown drive, capped with a 5-yard TD for running back Durand Henderson (28 carries, 107 yards) on a fourth-and-one play. Platte County threw an interception on its opening drive into the red zone then lost a fumble with a short field on its second possession. The Pirates’ next chance to score came when Gilbert (eight catches, 111 yards) caught a touch pass on his fingertips for a 44-yard gain. In the final minute of the first half, Platte County faced a fourth-and-goal at the 3 and chose to go for the touchdown. The pass fell incomplete and allowed Webb City to take a 7-0 lead into the break. Webb City came out of halftime and quickly went 76 yards on five plays with Link running in untouched from 11 yards out on an option keeper. TOP: Platte County senior wide receiver Devin Richardson (11) makes a 44-yard diving reception in the second half of a Class 4 semifinal Saturday, Nov. 18 at Cardinal Stadium in Webb City, Mo. BOTTOM: Platte County senior kicker Parker Lacina (10) makes a 47-yard field goal for the Pirates during the third quarter. Down 14-0, Platte County’s offense really started on the next drive, and a 44-yard completion down the home sideline to Richardson put the Pirates at the 1. Hardman, who totaled just 9 yards on 10 carries, scored from 1 yard out on the next play. Webb City went three-and-out, and Platte County cut the deficit to 14-10 on the final field goal of Parker Lacina’s accomplished four-year career — a 47-yarder with the wind at his back. A controversial call ended up providing the winning score. Webb City controlled the ball for the next 6-plus minutes, and on the first play of the fourth quarter, Link kept on an option keeper and went right toward the end zone from 5 yards out. He went into the end zone after Blankenship appeared to cause a fumble that Tongate recovered in the end zone. Officials quickly signaled a touchdown, ruling Link crossed the goal line before losing the ball. 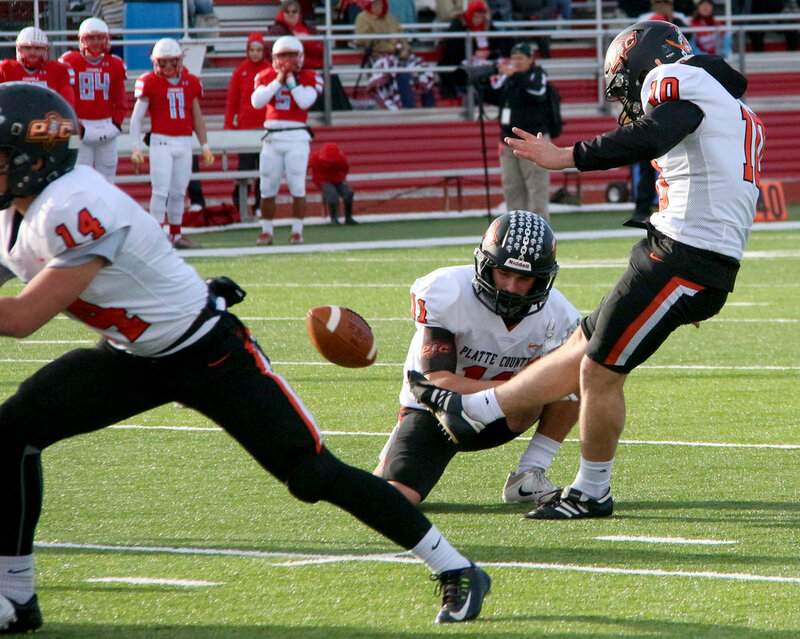 Platte County senior kicker Parker Lacina (10) makes a 47-yard field goal for the Pirates during the third quarter. Down 21-10, Platte County drove into Webb City territory before Clarkson took hard shots on two straight pass attempts — the second resulting in his second interception. Schmidt, who finished his career with a school-record 342 total tackles in three seasons, then grabbed the interception to set up Platte County’s final touchdown. “Turnovers are part of the game,” Utz said. “We got one on them and they got three. Obviously, you look at that and say, ‘There’s more possessions, could’ve got more points here or there.’ The game plays out the way it does. Hats off to them. They did what they needed to do and made plays when they needed to make plays. While Watts and some of his teammates thought time was left on the clock for a final play, Platte County players slowly realized their frustrating fate. Webb City played its first one-possession game of the season against the eighth team in Pirates’ history to win at least 11 games in a season. There were 18 seniors who helped create the matchup of two consistently strong programs and a memorable semifinal game. 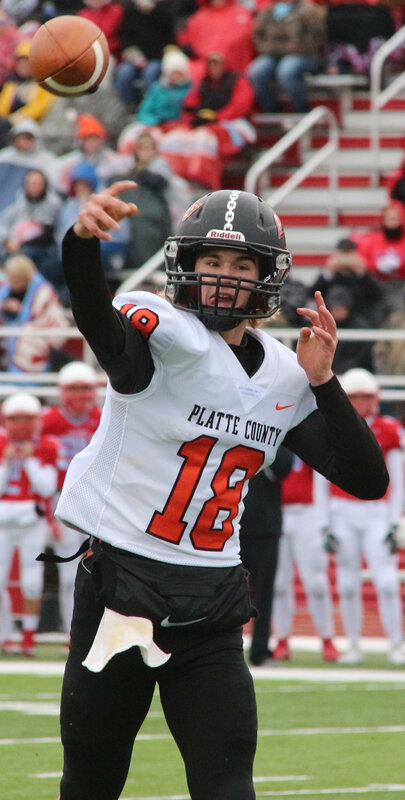 Long a consistent winner, Platte County broke back through into the state’s elite, hoping this run — despite the disappointing finish — provides motivation to next year’s team and those that follow. “You hope you build on it; you hope you grow from it,” Utz said. “Some of that goes away really fast so we hope these kids that have been playing are going to learn from it and want to be back here.